Qualified to be Auditor-Controller/Treasurer/Tax Collector? The Board of Supervisors is seeking qualified county residents to apply for the position of County Auditor-Controller/Treasurer/Tax Collector. The incumbent, Larry Walker, is retiring on March 4 and before that date the board must appoint someone to fill the remainder of Mr. Walker’s four-year term, which ends in January 2019. The board will conduct a public process to appoint Mr. Walker’s successor, including a public interview of the most-qualified applicants. State law requires the Auditor-Controller/Treasurer/Tax Collector to be a registered voter who lives within the County of San Bernardino and to possess certain specific qualifications in the areas of accounting and finance. Information on the process, qualifications, and how to apply can be found at http://cms.sbcounty.gov/hr/Home.aspx. The deadline to apply is January 29. Six months ago, the San Bernardino County Board of Supervisors conducted a special study session on homelessness and vowed to find housing for all homeless military veterans in the county by the end of 2015. A total of 401 veterans were identified as homeless and a County-led advisory group of community and private partners went to work on finding permanent housing for all of them by Dec. 31, 2015. By Thanksgiving, all 401 veterans had their housing issues solved, along with about 100 other homeless veterans who became homeless or moved into the county after the count. Despite finding housing for approximately 500 homeless veterans, about 100 veterans who became homeless after the count or moved into the county during the past several months remain without shelter, demonstrating the challenge extends beyond the goal set and reached by the County. “The County has developed an effective strategy to get homeless veterans off the streets and into permanent housing, and we will continue applying that strategy to help as many veterans as possible rebuild their lives and break out of the cycle of homelessness,” Second District Supervisor Janice Rutherford said. The Board of Supervisors applied existing resources to find housing for all the homeless veterans, but this time, the focus changed on how the resources would be applied. For instance, some landlords were hesitant to rent to homeless veterans, but the Board of Supervisors tapped into one-time general fund resources to cover security deposits and other costs to help landlords feel more secure in leasing to them. Philip Mangano, a national expert on homelessness and CEO of the American Round Table to Abolish Homelessness, has served as a key adviser and coordinator of the effort. The County’s advisory group included private partners such as the California Apartment Association, which helped communicate the need to landlords to address and remove impediments to housing. Advisory group members also included the Housing Authority of San Bernardino County, the County offices of Community Development and Housing, Veterans Affairs, Behavioral Health, Homeless Services, Sheriff, Workforce Investment Board and Public Health. LightHouse Social Service Centers, Loma Linda University Health, National CORE, Arrowhead United Way, Goodwill of Southern California, Inland Valley Hope Partners and the Faith Advisory Council participated in the advisory board. El Niño is expected to drop a large amount of precipitation on our region this winter. While the County is preparing and residents have been given instructions on what they should do to get ready, people that live in areas that have burned recently are presented with unique challenges. Normally, vegetation absorbs rain, but after a wildfire, the charred ground where that vegetation has been burned away creates a loss of soil strength and can no longer easily absorb rainwater, increasing the risk of flooding and mudflows for several years. Properties directly affected by fires, and those located downstream of burn areas, are most at risk. Post-fire landslide hazards include fast-moving and highly destructive debris flows. 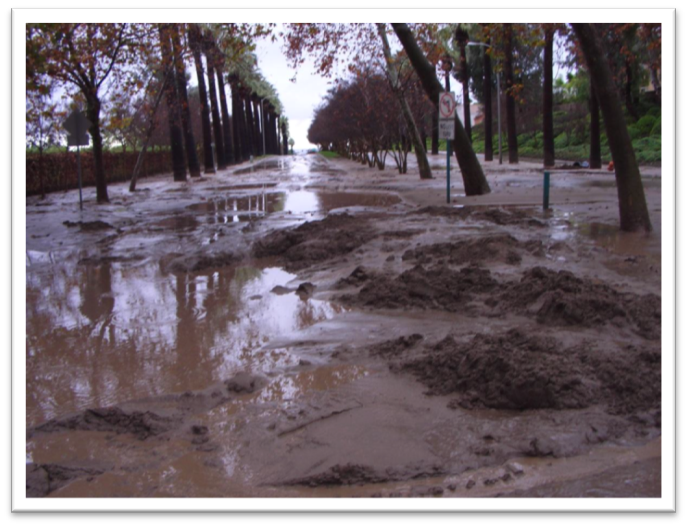 Post-fire debris flows are particularly hazardous because they can occur with little warning, can exert great impulsive loads on objects in their paths, can strip vegetation, block drainage ways, damage structures, and endanger human life. Wildfires could potentially result in the destabilization of pre-existing deep-seated landslides over long time periods. The best preparation for possible flooding is to plan ahead. The Ready!Set!Go! Flood Preparation brochure will show you some of the things you can do to protect your home, property and family. You’ll find information about how to prepare for wet weather, things like cleaning out rain gutters and storm drains, where you can sign up for emergency alerts, fire stations that have sandbags available, and what you should have in an emergency kit. There is also specific information for areas that have recently been burned by wildfire. Sandbags can best be used to help protect doorways if a waterproof layer like heavy plastic or waterproof canvas is placed behind them. If possible, secure it to the door frame. Stack the sandbags in a pyramid formation and wrap the plastic up and over the top. Keep in mind, sandbags DO NOT guarantee a water-tight seal, but properly placed sandbags can help redirect water, mud and debris away from your home. To find your closest sandbag location and other information on storm preparation check SBCoFire’s website at www.sbcfire.org. Check the National Weather Service at www.weather.gov to see current and upcoming weather events. National Oceanic and Atmospheric Administration’s El Niño Portal has regular El Niño forecast updates, www.elnino.noaa.gov. 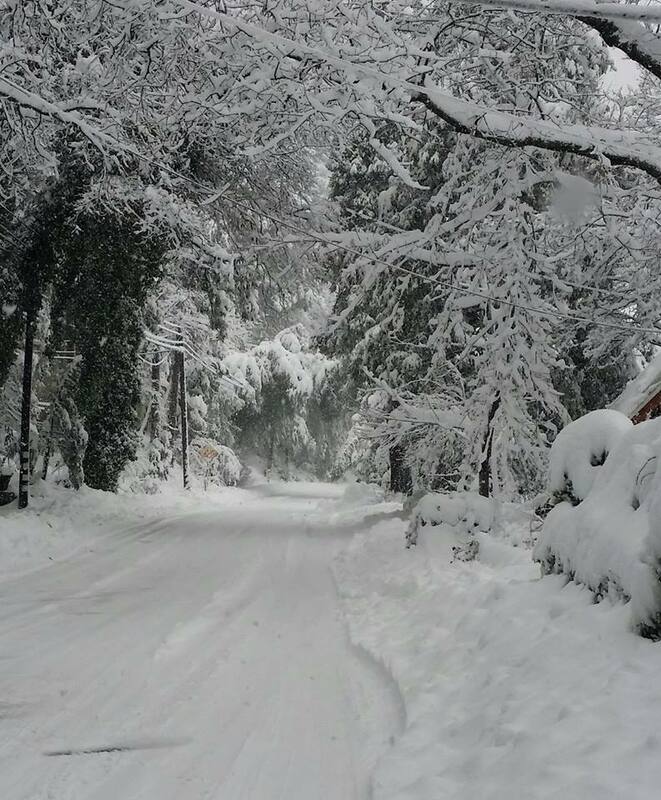 Motorists will have limited access at Valley of the Falls Drive on Highway 38 due to Southern California Edison’s work to restore power to San Bernardino Mountain communities. Officials anticipate the power in affected areas will be out until Monday afternoon. Residents who need shelter are urged to contact the American Red Cross at 909-888-1481 extension 7231 or 909-380-7230. Nonresidents are being asked to stay out of the area. Road blocks are in place limiting access to residents only. Also, if you see downed power line or dangling wire – even if it appears not to be live – don’t touch or approach it and call 911 immediately. County employees were moved by the compassionate, inspiring and powerful speeches former New York Mayor Rudy Giuliani and Pastor Rick Warren gave during Monday’s event at Citizen’s Business Bank Arena. To view photos from the event, click here to see our Facebook page. 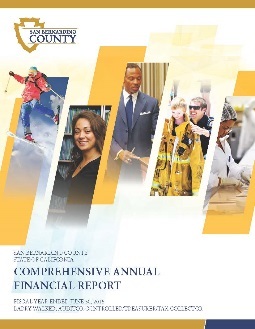 Comprehensive Annual Financial Report (CAFR) – This report presents a set of governmental financial statements comprising the financial report of the County of San Bernardino that complies with the accounting requirements promulgated by the Governmental Accounting Standards Board (GASB). 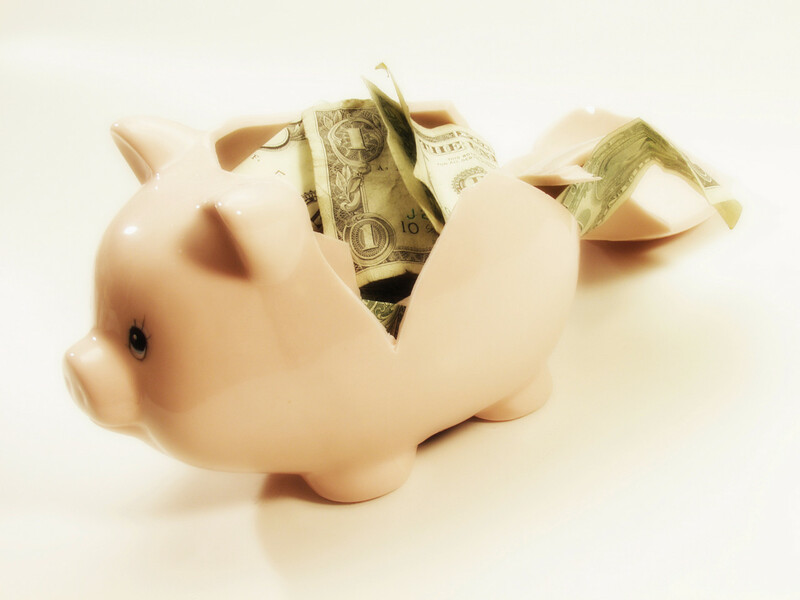 Popular Annual Financial Report (PAFR) – This report provides you an opportunity to learn about the County’s current financial condition and economic outlook in an easy-to-read format. The report includes condensed and simplified information obtained from the County’s CAFR. We encourage you to view these reports found on the Countyline Intranet Site at http://countyline.sbcounty.gov/acr/publications.asp. You are also able to access these reports on the ATC Internet Site at http://www.sbcounty.gov/ATC/Services/Documents. It’s Your Money. Get it! San Bernardino County Transitional Assistance Department (TAD) is partnering with the Internal Revenue Service (IRS) to provide FREE Tax Preparation and e-filing services for low to moderate income taxpayers throughout the county. The free service is available to all eligible taxpayers if you or your household made less than $54,000 in 2015! Federal and California state returns are prepared and e-filed by IRS certified tax preparers beginning January 25,2016. There are day and evening appointments Monday through Friday, as well as Saturday appointments available. For more information, and to schedule your appointment at our various County locations, please visit hs.sbcounty.gov/VITA or call (909) 347-1255 or (760) 552-6176. Click here for more information. Volunteers are needed for the 2016 Point in Time Count. This count/survey will help determine funding for homeless services in San Bernardino County and help The San Bernardino County Homeless Partnership understand the regional service needs of our homeless population. The event is scheduled for Thursday, Jan. 28, 2016 from 6 to 10 a.m., and volunteers are needed throughout the county. Go to www.sanbernardinocountyhomelesscounts.com for more information and to register to volunteer.